Demand or sales forecasting process vary from company to company, as the nature of business and of the product with market conditions are not similar for each type of product. Hence, it is not possible to lay down a standardized process for each type of product as well as for the company. The objectives of demand/ sales forecasting should be determined as a first step. It may include the period of sales forecasting (short-run or STEP-III long-run), territorial area of sales forecasting (specified area or the whole country), unit of sales forecasting (in terms of quantity or monetary), product or products sales forecasting (for an individual product or group of products) and the time, labor and money to be spent on sales forecasting etc. The objectives should be clearly defined. STEP-II-Determining the relative importance of the factors, which affect sales of each product: Having sub- divided the task of forecasting, the relative importance should be determined so that due weight may be given to different factors affecting sales forecasts. 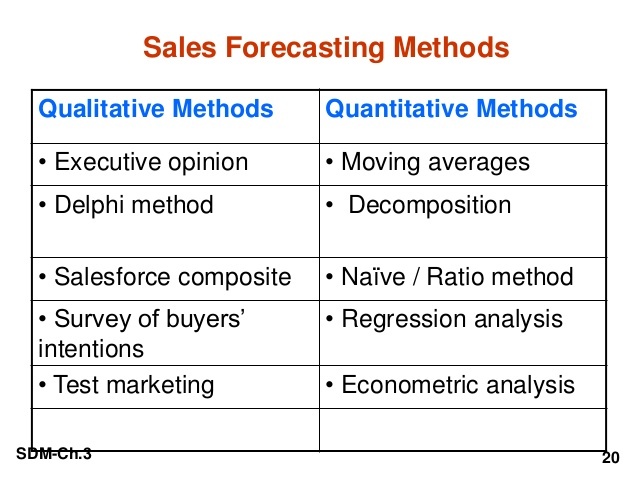 STEP-III- Selecting the appropriate forecasting method: The next step in sales forecasting is selecting an appropriate forecasting method. Combination of two or more methods may also be used. An appropriate authority should select the method (s) to be used in sales forecasting taking into account all the relevant situations, life cycle of the product, purpose of forecasting and the degree of accuracy required. STEP-IV- Collecting and analyzing the data: The next step to be taken in the procedure of sales forecasting is to collect the requisite data, tabulate and analyze it. Then it should be interpreted by applying statistical techniques and thereby draw necessary conclusions as to probable sales during a given period of time. It may be called the preliminary sales forecast and thereby forms the basis of final sales forecast. STEP-V-Making specific forecast relating to the products and territories involved: Afterwards, the above preliminary sales forecast results should be converted into final sales forecast relating to the product and the territories involved. STEP-VI-Periodically reviewing and revising the forecast: The figures for final sales forecast form the basis for the operations of the company in the next period. The actual sales performance in the coming period should be reviewed and evaluated from time to time. The evaluation work may be made monthly, quarterly, half-yearly or yearly. The forecast figures may be revised in the light of difficulties experienced during the course of actual operations. On the expiry of forecast period, the actual sales and forecasted sales should be compared and causes of variation be found out which would help the marketer to improve the next period sales forecast figures. Learn more about different steps in demand (sales) forecasting only at the University Canada West, one of the best universities in Canada, offering various business and management related programs.